We manufacture and export the high-performance Magnetic Level Gauge. “KABIR” manufactures high-performance Magnetic Level Indicator. It is a single chamber design with 2”, 2.5", OR 3" chamber diameter according to the application. There are twelve basic configuration styles, including top mounted models. “KABIR” magnetic level indicators are produced in a wide range of materials of construction, including plastics. “KABIR” also offers one of the complete selections of process connection types and sizes in the industry. It may be equipped with a variety of Level Transmitters and Switches, as well as, Flag & Shuttle indicators with or without stainless steel scales. This enables the “KABIR” to be a complete level and monitoring control. A change of level in the process tank corresponds to a similar change within the chamber. In response to the level movement, the float moves accordingly, actuating the Bi-Color Rotating Roller OR Red & Black Capsule for visual indication. Side Mounted Magnetic Level Gauge which is used to measure the level of fluids. Fabricated using superior quality basic material by employing advanced machinery and sophisticated tools, these products compiled to the defined parameters of the industry in an efficient manner. These magnetic level indicators are mainly used in the hazardous pressurized vessels. Therefore, customers can avail these offered products from us in multifarious sizes and specifications as per their requirement. 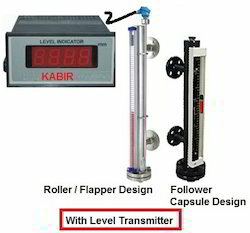 “KABIR” manufactures high-performance Magnetic Level Indicator. It is a single chamber design with 2”, 2.5", OR 3" chamber diameter according to the application. There are twelve basic configuration styles, including top mounted models. “KABIR” magnetic level indicators are produced in a wide range of materials construction, including plastics.“KABIR” also offers one of the complete selections of process connection types and sizes in the industry. It may be equipped with a variety of Level Transmitters and Switches, as well as, Flag & Shuttle indicators with or without stainless steel scales. This enables the “KABIR” to be a complete level and monitoring control. A change of level in the process tank corresponds to a similar change within the chamber. In response to the level movement, the float moves accordingly, actuating the Bi-Color Rotating Roller/ Flap OR Red & Black Capsule for visual indication. Looking for Magnetic Level Gauge ?